Sometimes there are lessons from the Board room. Today, there are lessons from the Laundry Room. I am sure there are many lessons from different ‘rooms’ in our life. But, what does the Laundry Room have to do with Leadership? Like the people you are leading, if you hear the funny noises, you better address it. If you ignore it, it will not go away!! 2) You need to be a good Planner – I know I shouldn’t do laundry at home, but even I know that a) you don’t put a wool sweater in the dryer, and b) you don’t put a RED shirt in with the whites. So, it is important to plan. Put the right ‘stuff’ with the right ‘stuff’ for success. 3) Delegation is important – You need to know what you are really good at…and more importantly, what you are NOT good at! If you are not good at ironing, delegate it to the dry cleaner, or buy clothes that don’t need ironed! 5) You must be a good organizer – Is there a place for everything and is everything in it’s place for your stuff? When you need to find your ‘fabric softener’ for the dryer, it is not a good time to learn you can’t find it when the washing machine is stopped. I want to thank my coach, Raymond Gleason, for the idea for this post. We need to always be looking for opportunities to teach and lead, no matter where we are. 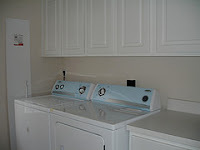 What am I missing from the Laundry Room? So, what room do you have Leadership Lessons from? Give me a room. I will identify the Leadership lessons’ potential from that room. Expensive laundry – There has to be a better way! UPDATE – Expensive laundry – There has to be a better way! This entry was posted on Sunday, May 3rd, 2009 at 11:55 am	and is filed under Leadership, Leadership metaphors, Miscellaneous. You can follow any responses to this entry through the RSS 2.0 feed. You can leave a response, or trackback from your own site. 1. TIMING is critical, especially as it relates to the final product (in this case, the DRYER). 2. If you do not give SOME strategic consideration right from the start, you could easily end up facing an “imbalance” during the implementation cycle. Great additions with the TIMING and strategic consideration. Absolutely! Hey – REAL MEN learn how to stay out of the laundry room!! Give me some lessons from the driveway basketball goal! !